The <sites> section group contains configuration settings for all sites on an IIS 7 server. The <sites> element contains a collection of <site> elements. When you create a new Web site, IIS adds a <site> element to the collection. Each <site> element contains configuration settings for a separate Web site hosted on your IIS 7 installation. For example, the Default Web Site and its settings are defined in a <site> element that is located between the opening and closing tags of the <sites> element; configuration elements for any additional site that you create are also located there. The <sites> section group can also contain the <siteDefaults>, <applicationDefaults>, and <virtualDirectoryDefaults> elements. The <siteDefaults> element defines default configuration settings for any site running on the server, the <applicationDefaults> element defines default configuration settings for any application running on the server, and the <virtualDirectoryDefaults> element defines default configuration settings for any virtual directory running on the server. IIS 10.0 The <sites> element was not modified in IIS 10.0. IIS 8.5 The <sites> element was not modified in IIS 8.5. IIS 8.0 The <sites> element was not modified in IIS 8.0. IIS 7.5 The <sites> element was not modified in IIS 7.5. IIS 7.0 The <sites> element was introduced in IIS 7.0. IIS 6.0 The <sites> collection replaces the IIS 6.0 IIsWebServer metabase object. The <sites> element is included in the default installation of IIS 7. 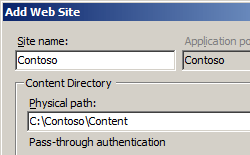 When you configure a new Web site on IIS 7, you must assign the Web site a site name and a physical path. There are also a number of optional configuration settings you can set. If you plan to continue to use the Default Web Site on your IIS 7 server, you must alter the binding information for the new site. You can do this by changing either the port or entering a host name for the new Web site. In the Connections pane, expand the server name, and then click Sites. In the Add Web Site dialog box, at a minimum, enter information in the Site name and Physical path text boxes and choose whether you want to enter information in the Host name text box or change the number in the Port box. On IIS Manager click the refresh button to verify that the site has started. You configure the <sites> element at the server level in the ApplicationHost.config file. Specifies default settings for all applications on the server. Specifies configuration settings for a site. Specifies default settings for all sites on the server. Specifies default settings for all virtual directories on the server. The following default <sites> element is configured in the root ApplicationHost.config file in IIS 7. In combination with the <site> element, the <sites> element replaces the IIS 6.0 IIsWebServer metabase property. 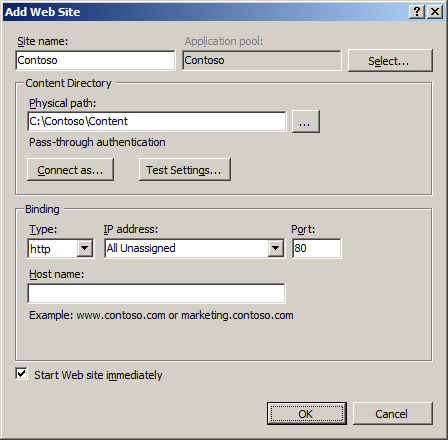 The following examples create a new Web site named Contoso with an ID of 2, and sets a binding for the HTTP protocol over port 80 with a host header of "www.contoso.com". The physical path for the new Web site is C:\Inetpub\www.contoso.com\wwwroot.